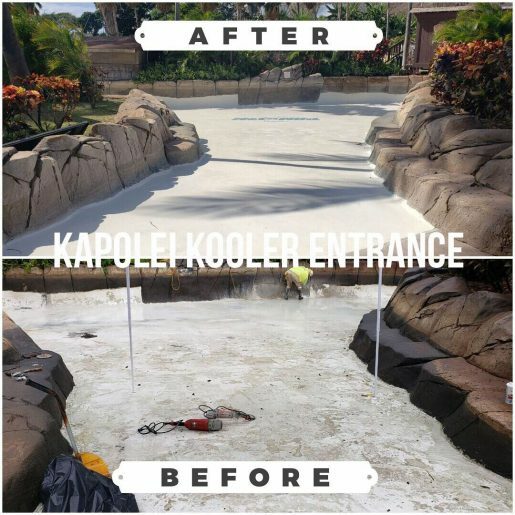 Each year in late February, Jerry Pupillo, general manager, Wet’n’Wild Hawaii, Kapolei, Hawaii, closes down the park for two weeks to do massive maintenance and refurbishing that can’t be done during daily and weekly maintenance. In March, the park finished its annual sprucing up for this year. “Many of the park’s rides now look brand spanking new,” he said. 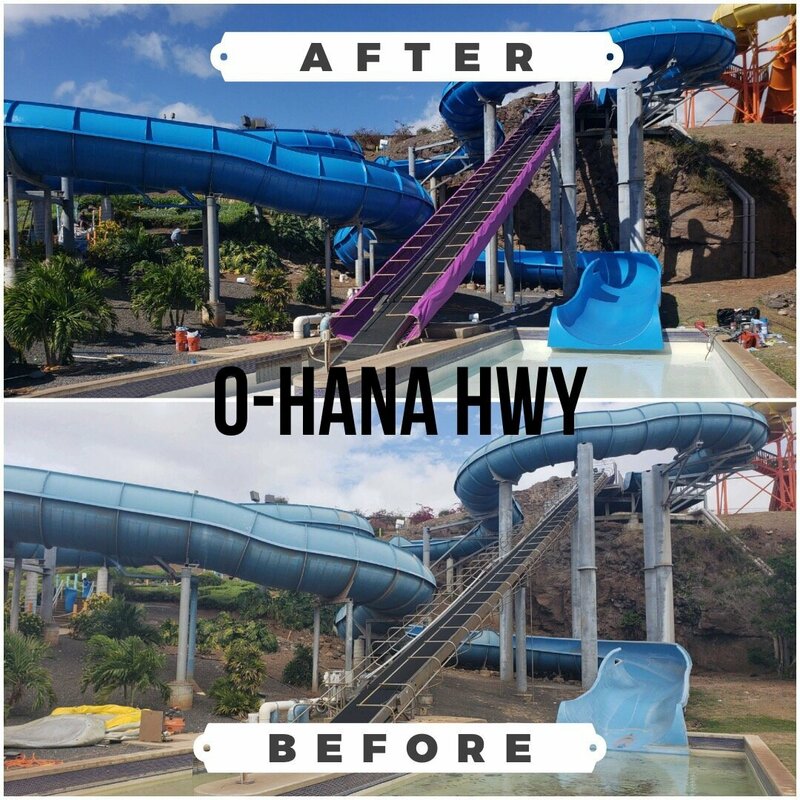 More than 600 gallons of paint were used to spruce up attractions, more than 750,000 gallons of water were used to wash the park, and approximately 40,000 square feet or almost a full acre of fiberglass, paint and pool refurbishing was done on rides and pools, Pupillo said. This required more than 3,000 man hours in 10 days, at a cost of $600,000 for the refurbishment. The project also included 180 square yards of waste removal (construction and green waste). 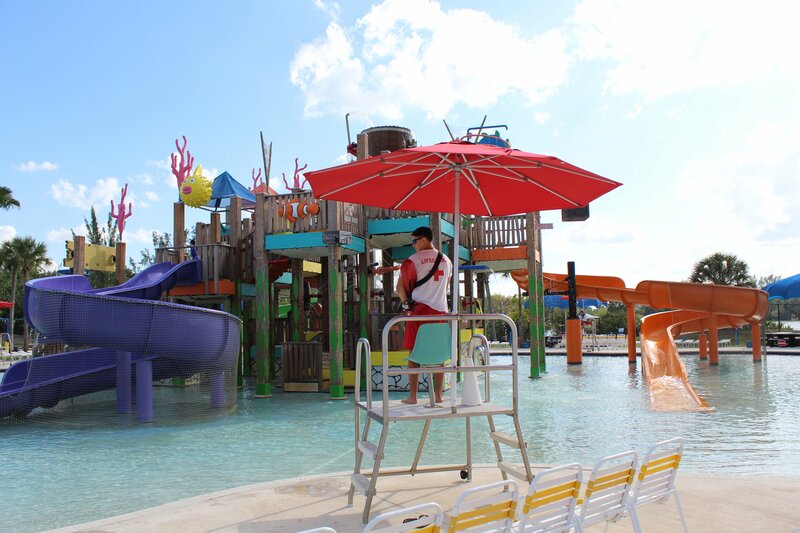 Colton Carpani, lifeguard, Paradise Cove Waterpark, Pembroke Pines, Fla. Lifeguards and the maintenance team perform maintenance tasks prior to opening. In addition, Wet’n’Wild Hawaii fixed netting around pool perimeters, so that no guest wanders into pools when they aren’t operating. Deep cleaning included pressure-washing stairs, restrooms, pathways, buildings and seating areas. The park also changed out all of its park flags to fun vibrant colors. More cabanas give guests different areas in the park to kick back and relax. New attraction safety signs are easier to read. 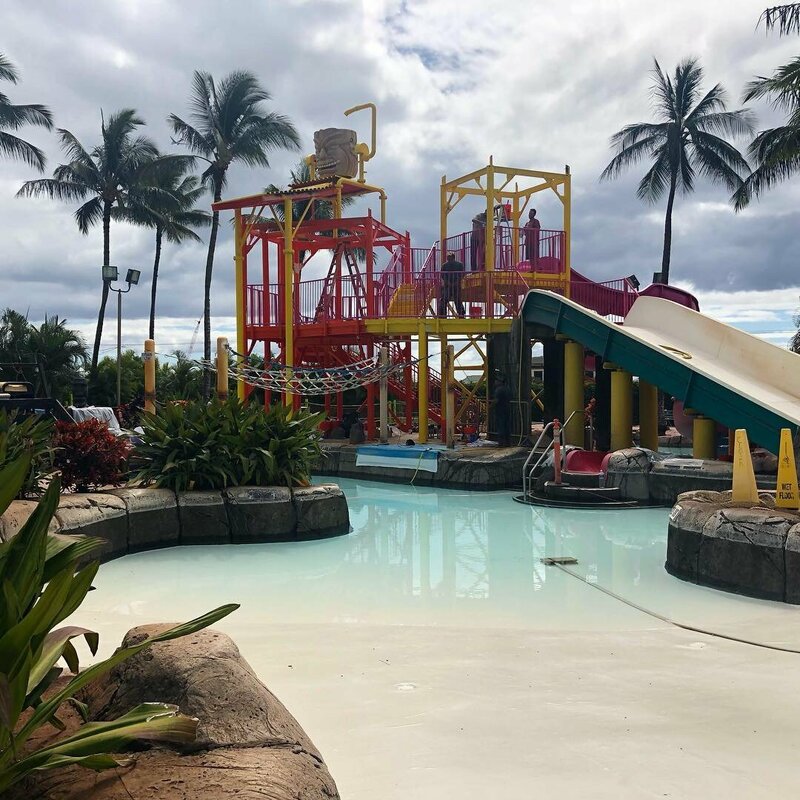 During the off season, from November to February, Brian McLaughlin, senior parks manager, Paradise Cove Waterpark, Pembroke Pines, Fla., said staff and an engineer determine what repairs and maintenance are needed. Then, lifeguards, along with assistance of the division’s maintenance team, begin to remove, de-rust and repaint items as needed. Prior to the park’s opening, lifeguard staff clean, buff and wax slides and water playgrounds. They also repaint buildings to improve the facility’s overall appearance. Pools are checked for hollow points in pool surfaces and repaired, McLaughlin said. Park staff check all pumps and motors; an outside contractor services them if needed. Additionally, all shade structures and Funbrellas are monitored for wear and tear and repaired. Finally, park staff performs general landscaping and trim trees. “All of this is done in order to extend the life of amenities, as well as to ensure that patrons have a safe and pleasant experience,” McLaughlin said. The Kapolei Kooler entrance at Wet’n’Wild Hawaii in a before and after picture. It cost $600,000 to refurbish the park. At the end of the season, each department provides a list of items which need repair, improvement, replacement and or consideration for upgrade to newer technology, said Steve Miklosi, general manager, Wild Water Adventure Park, Clovis, Calif. Then, management and ownership determine the budget for various projects approved for the coming season. Some items on a cyclical basis are painting pools, replacing and upgrading wooden structures, repairing and replacing deteriorated concrete, reviewing and upgrading electrical components at the park, and evaluating and testing pumps and motors. For 2019, Miklosi said special projects include lining walkways with new posts and netting, and replacing posts and rope around the wave pool with new posts and colorful netting, which are both a cosmetic and safety enhancement. The park will also refurbish its wave unit this season and expand its catering area to improve capacity and customer service. A view of a slide and other play features at Wet’n’Wild Hawaii. In March, the park finished its annual sprucing up for this year. 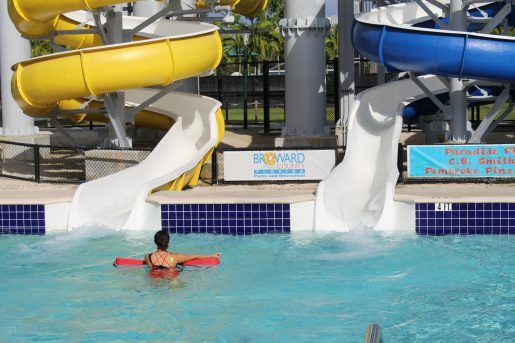 Bob Martin, general manager, Island Waterpark, Fresno, Calif., said spring projects include repairing and replacing filtration components, refurbishing motors and pumps, inspecting slides and towers, and repairing cracks in fiberglass. “These are done for guests’ safety, and are required by the state, county and insurance inspectors,” he said. 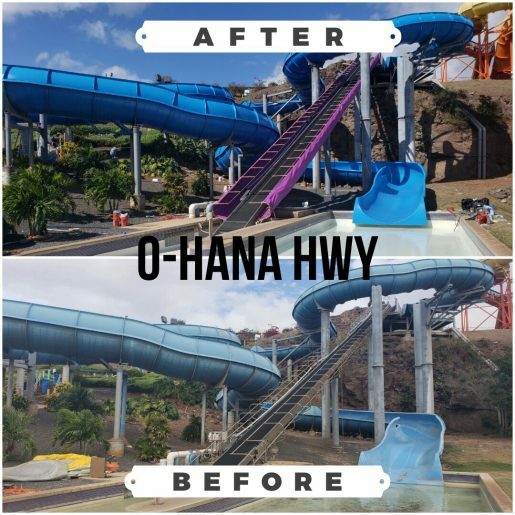 A before and after photo of O-Hana Highway at Wet’n’Wild Hawaii in Kapolei. Each year in February, the park closes down for two weeks to complete maintenance. At Pirates Bay Waterpark in Baytown, Texas, staff repaints everything each spring so it has a fresh new look. Furthermore, all play structures, slides and shade structures are inspected and fixed as needed. Landscaping contractors clean up palm trees, flower beds and other vegetation. During alternating years, contractors gel coat, buff and wax slides. All motors, chlorinators and acid pumps are checked for malfunctions. “Providing excellent and safe conditions for continued use by guests is our primary goal,” said Jenna Stevenson, aquatics superintendent. Karina Balladares, a lifeguard at Paradise Cove Waterpark. During maintenance work, pools are checked for hollow points in pool surfaces and repaired.